In Defying the Odds, we note that the social and political gap between white working-class America and the professional class. The U.S. economy was not great again in the first quarter of Donald Trump’s presidency. The Commerce Department said Friday that gross domestic product expanded at just a 0.7 percent annual rate in the first three months of the year, a sharp drop from the 2.1 percent growth in the final quarter of last year. It marked the economy's worst performance since the first quarter of 2014. First-quarter GDP data has been notoriously bad in recent years only to improve in subsequent months. But the grim headline a day before Trump travels to Pennsylvania to celebrate his first 100 days delivers a significant political blow to a president who loves to hype economic data like strong jobs reports even though his policies so far have little to do with them. Many economists expect U.S. growth to rebound in the second quarter of 2017, and they believe it to be on solid footing in general, especially as it is bolstered by the improving economic situation abroad. Still, in the long term, they expect GDP growth to hover around 2 percent. They argue that the economy Trump has promised — one in which GDP is expanding at a pace of 3 percent a year or more and 25 million new jobs are created in the next 10 years — is probably unattainable. Long-term changes in the economy, including demographic trends such as the aging U.S. labor force, will also complicate Trump's bid for rapid economic growth, the experts say. Although more Americans have gone back to work since the financial crisis nearly nine years ago, the percentage of the population that is working has declined in recent years as baby boomers retire, limiting how much the economy can produce. At the beginning of 2000, 67.3 percent of the adult population was working or looking for work. As of last month, that figure was 63 percent. Diane Swonk, a Chicago-based economist, took a dim view of Trump's proposal to create 25 million jobs in the next decade. “There's been a resistance to deal within the constructs of mathematical reality,” she said. In Defying the Odds, we note that Trump was unprepared for the presidency. Inconveniently interrupting the “He’s getting better!” meme, Trump’s interview with Reuters on Thursday is nothing short of terrifying. His cluelessness about the world persists “This is more work than in my previous life,” he says. “I thought it would be easier.” That smacks of “Nobody knew health care could be so complicated.” — which amounts to admission of complete ignorance of the world’s complexity and insistence that everyone is as blind as he (was). Nowhere has Trump’s learning curve been steeper than Capitol Hill. According to people close to the president, Trump believed that in selecting Priebus as chief of staff he was getting a deeply connected Washington wise man, someone who could guide his agenda through Capitol Hill. Between Priebus and Vice President Mike Pence, who once served in House leadership, Trump thought he had the experts he needed and wouldn’t have to worry about Congress that much. But Priebus is a political insider, not a congressional one. And Pence, who was governor of Indiana before joining Trump’s ticket, has been absent from the Hill during the rise of the House Freedom Caucus, the ideological hardliners who delivered Trump the most stinging defeat of his young presidency. House Republicans’ rejection of his plan to repeal-and-replace Obamacare served as a wake-up call — and a clarifying moment when he realized he couldn’t leave Congress to others, even Speaker Paul Ryan. "People will be better off with pre-existing conditions under our plan. That's the whole goal here." Ryan is saying that people will be better off with preexisting conditions. People who actually have preexisting conditions (e.g., diabetes) would disagree, saying that they would rather not have them. What Ryan meant to say is: "People with preexisting conditions will be better off with the GOP plan." That statement would be untrue, but at least it would make sense. The Lugar Center, led by former U.S. Senator Richard Lugar, and the McCourt School of ublic Policy at Georgetown University today jointly released their new Bipartisan Index rankings of all members of Congress, completing the picture of the 114th Congress (2015-2016). The non-partisan tool indicates the degree to which Senators and Representatives work across party lines. The rankings of the 114th Congress are based on bill sponsorship and co-sponsorship. They are directly comparable to the data for the 113th Congress (2013-14), which was one of the most partisan of the past 20 years, and provide historical context for the increased partisanship in Congress over the past two decades. According to the new figures, 61 senators improved their Index scores, while 23 fared worse. In the House, 212 members had higher scores for the 114th Congress than the 113th, while 139 had lower ones. The new data allows voters to see over time how willing their senators and representatives have been to work across party lines. Based on the scores, Senator Susan Collins (R, Me.) was the most bipartisan senator and Rep. Pete King (R, NY) was the most bipartisan representative. This is the second Congress in a row in which Senator Collins finished with the top Senate score. Rep. King was second among all House members in the previous Congress. For the Senate in the 114th, 45 senators were above zero, and therefore judged to be “bipartisan,” meaning they scored better than the average senator in their circumstances during the 20-year baseline period (1993-2013). Fifty-three senators scored below zero. This is an improvement from the 113th when 36 senators scored above 0.00 and 62 scored below it. The Bipartisan Index measures how often a member of Congress introduced bills that succeed in attracting co-sponsors from members of the other party, and how often they in turn co-sponsor a bill introduced from across the aisle. The Index is based on a formula applied uniformly to all members. No subjective judgments are made about individual members or bills. The Index serves as a critical resource for voters and the media and, its sponsors hope, encourages lawmakers to be more bipartisan when writing or co-sponsoring legislation. The scores released today update interim scores released last year for the calendar year 2015, the first session of the 114th Congress. Bipartisan Index scores tend to rise modestly during the second year of a Congress due to Index components that benefit from the accumulation of bipartisan bills and co-sponsorships. Therefore, the scores for the entire 114th Congress will tend to beat those of the first session. NAFTA Was Reagan's Idea. Gingrich Secured Its Passage. Trump is reportedly considering an executive order to pull out of NAFTA. If so, he is renouncing a key achievement of modern conservatism. Ronald Reagan first proposed a free trade agreement between the U.S. and Mexico in his 1980 presidential campaign. Since that time, The Heritage Foundation is proud of the role it has played in articulating President Reagan's vision of free trade in Latin America and around the world. Since the mid-1980s, Heritage analysts have been stressing that a free trade agreement with Mexico not only will stimulate economic growth in the U.S., but will make Mexico a more stable and prosperous country. Heritage has published over three dozen studies stressing the benefits of free trade in North America. Half of Americans say they have little to no confidence that Republican efforts to repeal and replace Barack Obama's Affordable Care Act would make things better, according to results from the latest NBC News/Wall Street Journal poll. David Nather reports at Axios that House Republicans want to cut Affordable Care Act insurer payments. The Kaiser Family Foundation did the math on those ACA insurer payments, to see what happens if Congress doesn't provide them because of Republican objections. Turns out the federal government would actually have to spend $2.3 billion more in that case, because it would have to pay for bigger tax credits for ACA customers. Net increase in government spending: $2.3 billion. Forty-five percent of respondents in the survey believe Trump is off to a poor start, with an additional 19 percent who say it's been "only a fair start." That's compared with a combined 35 percent who think the president's first three months in office have been either "good" or "great." Trump's 100th day in office takes place on April 29. 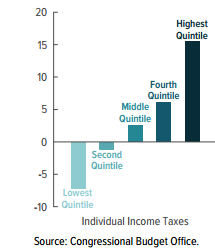 By contrast, in the exact same question from April 2009 NBC/WSJ poll, 54 percent of Americans said that Barack Obama's first 100 days had gotten off to either a good or great start, while 25 percent said they were fair, and 21 percent called them poor. Trump's overall job-approval rating stands at 40 percent — down four points from February. It's the lowest job-approval rating for a new president at this 100-day stage in the history of the NBC/WSJ poll. In Defying the Odds, we compare the 2016 campaign to the 1992 race, pointing out that both featured a Clinton, a Bush, and a bombastic billionaire. But Trump not only resembled Perot in certain respects, he also drew on the same issues as Pat Buchanan. The social and economic forces driving the two Americas apart had been brewing for a long time. But why did they have such impact in 2016, and not ten years earlier? One reason was the Great Recession, which slammed working-class communities, and whose effects lingered long after its official conclusion. In 2016, Pat Buchanan looked back at his 1992 race and told journalist Jeff Greenfield: “Those issues started maturing. Now we’ve lost 55,000 factories. … When those consequences came rolling in, all of a sudden you’ve got an angry country. We were out there warning what was coming. In Defying the Odds, we discuss the 2016 election, pointing out that the Democratic Party has moved to the left, particularly on social issues such as abortion. At The Atlantic, Emma Green spoke with Michael Wear, former director of Barack Obama’s 2012 faith-outreach efforts, who said: "The Democratic Party used to welcome people who didn’t support abortion into the party. We are now so far from that, it’s insane." Mr. Sanders and the new leadership of the Democratic National Committee touched a party sore spot this week when they took their “Unity Tour” to Omaha to rally for a mayoral candidate who opposes abortion rights. Mr. Sanders, repurposing the themes of his presidential bid, told a crowd of about 6,000 on Thursday night that the candidate, Heath Mello, 37, would be a future star in the Democratic Party who could help break the grip of big money on the nation’s politics. Identity politics reared its head, and pro-abortion forces attacked, forcing party chair Tom Perez to backtrack. In an interview on Friday, Mr. Perez further toughened his language, saying he respected those Democrats who “have personal beliefs” against abortion rights but warning them not to pursue such policies in office. “If they try to legislate or govern that way, we will take them on,” he said. In Defying the Odds, we discuss the improbable presidential candidacy of Bernie Sanders. Vermont Sen. Bernie Sanders (I) is the country’s most popular active politician, underscoring his importance to the Democratic Party as it seeks to rebuild in the wake of a disastrous 2016 election cycle. White House chief strategist Stephen Bannon is far and away the least popular political figure in the poll, with only 16 percent viewing him favorably, compared with 45 percent having a negative view of him. Stranger Things: Policy and Politics during the First 100 days of the Trump Administration. National Republicans had to pour in millions just to keep Ossoff under 50 percent. The super PAC aligned with Speaker Paul Ryan spent more than $3 million on a rescue mission. After seeing polling on March 24th that showed Ossoff at 42 percent and rising, the group deployed an organizer to Atlanta the next day. He oversaw a full-time paid field team of 100 that has knocked on doors seven days a week since. "If we had waited another couple of weeks, it would have been too late," said Corry Bliss, executive director of Congressional Leadership Fund, told the Washington Examiner’s David Drucker. Many vulnerable Senate Democrats saw their campaign donations soar during the first three months of the year, as they raced to demonstrate early financial strength ahead of the 2018 battle for the Senate. The 10 Democratic incumbents up for re-election in states carried by President Trump collectively raised nearly $19 million between Jan. 1 and March 31, more than twice what they collected during the comparable period of their last Senate campaigns, a USA TODAY tally of newly released figures shows. There will be no shortage of money on the Republican side, either. The National Republican Senatorial Campaign Committee raised $7 million in March alone, its highest monthly haul in a non-election year, party officials said. And new Federal Election Commission filings show that several House Republicans considering bids against vulnerable Senate Democrats have assembled massive war chests in the first three months of the year. Nathan Gonzales, who tracks Senate races as editor of the non-partisan Inside Elections newsletter, said the surge in fundraising underscores the power of incumbents to raise money and the energy of liberal donors in the Trump era. “If you are a Democrat and you are not raising a lot of money right now, there’s something wrong with you,” Gonzales said, noting the record sums flowing into a Georgia House race to back Democrat Jon Ossoff, a 30-year-old political novice competing in a Tuesday special election. President Donald Trump's image among Americans as someone who keeps his promises has faded in the first two months of his presidency, falling from 62% in February to 45%. The public is also less likely to see him as a "strong and decisive leader," as someone who "can bring about the changes this country needs" or as "honest and trustworthy." When asked to compare Trump with previous presidents, 51% say they trust what Trump says less than they trusted what previous presidents said while in office, compared with 30% who say they trust him more and 16% who say they trust what he says about the same as what previous presidents said. The public continues to have concerns about Trump’s decision making. Overall, 63% say that Trump is too impulsive in making important decisions, while 32% say his approach is about right; just 2% say he is too cautious in making important decisions. Views on this question are similar to those shortly before he took the oath of office: In January, 58% said they thought Trump would be too impulsive in making important decisions. About half (51%) of Americans have an unfavorable view of the Democratic Party, while 45% have a favorable view. In January, slightly more had a favorable than unfavorable view (51% favorable to 45% unfavorable). Today, 57% of Americans have an unfavorable view of the GOP, while 40% have a favorable view. In January, Americans were about equally likely to view the GOP favorably (47%) as unfavorably (49%). A North Carolina legislator used his Facebook campaign page on Wednesday to compare President Abraham Lincoln to Adolf Hitler. Rep. Markwayne Mullin told his constituents Monday during a town hall meeting in Jay that it is “bull crap” that they pay his salary. “You said you pay for me to do this (represent you in Congress). Bull crap. I pay for myself,” the third-term Republican said. “I paid enough taxes before I ever got there and continue to through my company to pay my own salary. @bradbainum Actually, he said that nobody has to use the internet. They have a choice. Big difference. 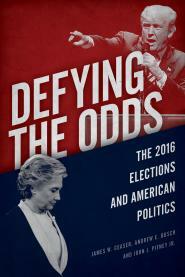 In Defying the Odds, we discuss the impact of inequality on the 2016 election. ...Arnade, a former banker who now travels across the country writing about poverty and addiction, said that his work had shown him that there are "two Americas," who look at things "really, really differently." It's a divide, he said, that the election of President Donald Trump had "exposed." "The front row defines itself through its career. You can think of it that way. That's their meaning to them. Whereas the back row is somebody who if they have an education beyond high school it's been cobbled together through community colleges, through smaller state schools. And they generally work with their muscles, not their mind," Arnade told Stelter. Arnade said there was only one question he needed to ask during his reporting trips to tell if someone belonged to a back-row community. "One of the biggest questions I'll ask is -- do you think your children's life will be better than yours? And is your life better than your parents'? Almost in unison, the answer is no, I don't think my children's life is gonna be better than mine," he said. But the Trump administration is more vulnerable to conflicts than the prior administration, particularly after the president eliminated an ethics provision that prohibits lobbyists from joining agencies they lobbied in the prior two years. The White House also announced on Friday that it would keep its visitors’ logs secret, discontinuing the release of information on corporate executives, lobbyists and others who enter the complex, often to try to influence federal policy. The changes have drawn intense criticism from government ethics advocates across the city. Trump has admitted that he is not intellectually curious. In a moment of candor, he told The Post’s Marc Fisher last summer that he has not read any biographies of presidents. He said he would like to someday but never has time. Then he explained that he does not need to read extensively because he reaches the right decisions “with very little knowledge other than the knowledge I [already] had, plus the words ‘common sense,’ because I have a lot of common sense.” Trump told Marc he is skeptical of experts because they can’t see the forest through the trees and lack his good instincts. This is a break with many of his predecessors. Barack Obama, George W. Bush and Bill Clinton all invited elite historians for private dinners at the White House. Each thought deeply about his place in history as he mulled weighty decisions. Bush, who majored in history at Yale, heavily employed historical analogies in his speeches. John F. Kennedy even hired Arthur Schlesinger Jr. to be his in-house historian. One important reason the new president has flip-flopped so much in recent days is because he has never grappled deeply or seriously with most issues. Trump has typically staked out whatever position was most politically expedient at that moment and then confidently argued for it, untethered by core convictions beyond a desire to make money, build his brand and win elections. “He's learning the job,” Mitch McConnell told Newsmax TV in an interview that aired yesterday. The basic source of misunderstanding stems from the legal categories under which federal financial activities are reported. Formal political party committees are designated, but all others are lumped together as non-party actors. Within the supposedly “non-party” organizations are four major Super PACs clearly associated with congressional party leaders. The Congressional Leadership Fund and Senate Leadership Fund are associated strongly with the House and Senate Republican leaders; the Senate Majority PAC and House Majority PAC are strongly associated with the Democratic leaders. When the leadership committees are included in the calculations, the picture comes to look radically different from the conventional wisdom. These four committees were massively important in 2016, spending $232 million in general elections for the House and Senate (see table 1). This more than doubled the $114 million of independent expenditures (IEs) by the comparable committees in 2014*. Substantial increases were posted by each of the four leadership PACs – House and Senate, Democratic and Republican. By comparison, the four formal party committees’ IEs and receipts stayed roughly level. (For party receipts since 2002, see table 4.) The remaining non-party committees spent less on IEs in House races in 2016 than 2014 but more for the Senate, with the combined total going up by about 15%. Taken together the formal party committees and the leadership Super PACs combined to outspend all of the other non-party spenders by a margin that was more than four times as large in 2016 ($132 million) as in 2014 ($29 million). In Senate elections, the battle for majority control stimulated substantially more non-party IEs than for the House. As a result, the parties plus leadership committees together spent roughly the same amount in the eight states with the highest IEs as all other non-party organizations combined. These races accounted for 92% of all general election IEs in the Senate (see table 3). Independent spending in these eight races nearly doubled candidate spending, 1.97 to 1. When candidate spending is included, the candidates plus parties accounted for 65% of all spending in the eight Senate elections. The other 35% came from non-party organizations other than the leadership Super PACs. In the generally less competitive races below these top ones in both House and Senate, spending by the candidates predominated. The 35% coming from these truly non-party organizations is significant. It is much more than one would have seen before Citizens United. But parties have found a way to fight back; and neither they nor the candidates have been displaced. The precise way in which the parties have rebounded says something about the current law’s permeability. 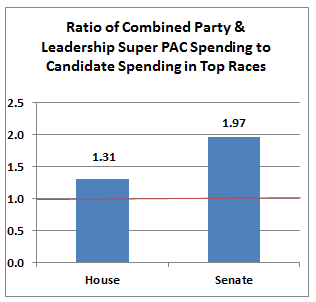 The four leadership Super PACs raised about three-quarters of their 2016 money from individuals. Of that, 80% of the money from individual contributions came from donors who gave the Super PACs more than the maximum they would have been allowed to give the formal party organizations. The remaining money going to the leadership Super PACs came from organizations (including corporations) that may not give to the formal parties at all. By combining unlimited contributions from all these sources, the leadership Super PACs’ funding looks much like the soft-money the formal parties accepted before the Bipartisan Campaign Reform Act of 2002 (BCRA). The two main differences are these. First, before BCRA the soft money typically would be spent on “issue ads” targeting specific candidates. Unlike IEs, these could not “expressly” advocate the election or defeat of those candidates. Second, spending by the new leadership Super PACs ostensibly has to be “independent” of the candidates’ and parties’ campaigns while the soft-money spending before BCRA – by wearing the fig leaf of being about issues – did not have to wear the similarly thin fig leaf of claimed independence. 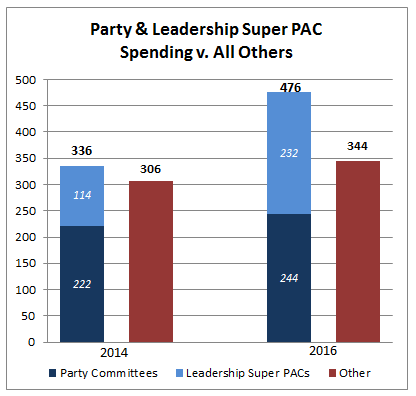 Table 1: General Election Independent Expenditures, Party and Leadership Super PACs, 2014-2016. Bill Bishop, co-author of the book “The Big Sort” and a founder of The Daily Yonder, makes the case that the political split in America is not an urban-rural divide. Instead, he argues, it is between the largest cities and the rest of America. outside of cities of a million or more — and really outside of the 56 central city counties of these large metros — Democrats lose. This applies not only to presidential races, but to the House as well. In a piece for The Daily Yonder, Bishop wrote that “Democrats don’t have a ‘rural problem.’ They have an ‘everywhere-but-big-cities problem’.” He provided data on the pattern of partisan victory in 2014 House races on a scale from super urban to very rural. Democrats won a majority of districts only in the most urban counties, while Republicans won two out of every three in very rural districts. is tied into lifestyle and lifestyle aligns with politics. Politics, like lifestyle, is one way we construct our identities. The accelerated shift toward urban prosperity and exurban-to-rural stagnation reinforces polarizing disagreements between city and country on matters ranging from family values to education to child rearing practices to religious faith. The two maps below show results by county in 1992, when Bill Clinton first won the presidency, and in 2016, when Trump did. The maps demonstrate the strategic hurdles currently confronting both parties. In 1992, Bill Clinton won 1,519 counties to 1,582 carried by George H. W. Bush. In 2016, Hillary Clinton won majorities in 490 counties to Trump victories in 2622. Obama won 875 counties in 2008 and 693 in 2012. Trump thought China could fix North Korea until the Chinese president politely informed him that North Korea is in fact complicated. Trump seems to have required the leader of China to explain basic facts to him that he could have Googled, or at least asked one of the many US government North Korea experts about. Trump came to a profound realization about one of the most dangerous conflicts on earth after a 10-minute conversation. Trump is getting his information about East Asian affairs from the leader of America’s largest rival in the region. TRUMP: I was sitting at the table. We had finished dinner. We're now having dessert. And we had the most beautiful piece of chocolate cake that you've ever seen and President Xi was enjoying it. Americans' support for the military strikes against Syria last week is historically low compared with reactions to previous U.S. military actions. Fifty percent of Americans approve of the missile airstrikes, while 41% disapprove. Ten percent have no opinion. Gallup has measured Americans' reactions to 11 other military interventions before the latest airstrikes in Syria, stretching from the invasion of Grenada in 1983 through the military action against Islamic militants in Iraq and Syria in 2014. The complete question wording used in each assessment appears at the end of this article. A majority of Americans approved of all of the previous actions tested with one exception: 47% approved of the bombing of Libya in 2011 (37% disapproved). Americans were most supportive of the initial intervention in Afghanistan in October 2001, in the aftermath of the 9/11 terrorist attacks in the U.S., and were also initially very supportive of interventions in Iraq in 1993 and 2003. The 50% approval of the recent missile strikes against Syria is roughly similar to three other actions tested over the years with approval around the 50% level -- Libya in 2011 (47%), Kosovo and the Balkans in 1999 (51%), and Grenada in 1983 (53%). Gallup also shows that his approval rating has flattened at 40% for several days. Most foreign policy entanglements do not result in a “rally around the flag” event — when a president’s popularity jumps because Americans rally behind their commander-in-chief. That’s according to a 2001 study by William Baker of the Arkansas School for Mathematics and Sciences and John Oneal of the University of Alabama. 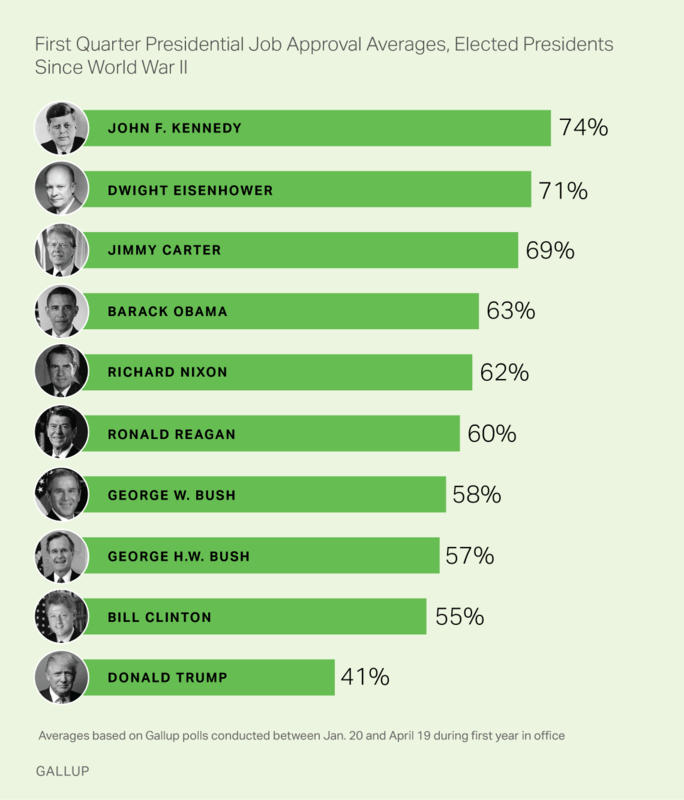 Their study found that only 39 percent of U.S. military interventions1 from 1933 to 1993 resulted in a rise in the president’s approval rating. Still, 39 percent is a sizable minority of the time. So, will President Trump’s order to launch missiles at a Syrian airfield be one of them? After former President Barack Obama laid out a four-point plan to go after the Islamic State group in 2014, I described five characteristics of foreign policy interventions that tend to increase the chances of a rally-around-the-flag effect. The list, compiled from political science papers, isn’t comprehensive, but it provides a good blueprint: The more points an intervention hits, the more likely the president’s approval rating will increase. Let’s take them one at a time. 1. Americans tend to react with greater enthusiasm when there is bipartisan support for an intervention. 2. Americans tend to give the president a boost when he’s acting against a major power. 3. Americans seem to respond more positively when the U.N. Security Council gives its approval to a foreign endeavor. 4. Americans are more likely to warm toward the president when there are revisionist goals at stake. 5. Americans are more likely to rally behind a president at the beginning of his presidency. Half of Americans support President Donald Trump’s missile strikes against Syria in retaliation for the Syrian government’s reported use of chemicals weapons on its citizens, according to a new HuffPost/YouGov survey. The poll also found some Americans concerned about Trump’s preparation for the attack and his failure to seek congressional authorization. Fifty-one percent of Americans say they support Trump’s decision to order strikes, with 32 percent opposed, and 17 percent uncertain. Four in 10 view the strikes as an appropriate response, with 25 percent considering them too aggressive, and 10 percent not aggressive enough. Still, the poll found pessimistic views of the attack’s efficacy. Just one-third of the public thinks the strikes will be even somewhat likely to deter the use of chemical weapons, with 46 percent believing they’re somewhat unlikely or very unlikely to have any such effect. There was little support for further U.S. response. Only 20 percent of Americans want Trump to take additional military action, while 36 percent say he should not. A plurality, 45 percent, was unsure. Fifty-seven percent of Americans approve of the airstrike against Syrian military targets – calling immoral the Syrian regime’s use of chemical weapons that led to the strike - but most are leery of any military involvement beyond airstrikes, a CBS News poll shows. Few Americans are willing to see the U.S. get involved in Syria beyond the use of airstrikes. Only 18 percent would want ground troops. Half of Republicans would limit involvement to either airstrikes or diplomacy, and Democrats largely would focus on diplomatic efforts. Seven-in-ten Americans think Mr. Trump needs to get authorization from Congress before any further action against Syria; more than half of Republicans agree. Americans support last week’s U.S. strike in part because most say the use of chemical weapons is immoral. There’s more division on whether it constitutes a direct threat to the U.S.
Back in 2013, most Republicans opposed the idea of airstrikes against Syria by President Obama, and half of Democrats were opposed then, as well. Since the strike. Mr. Trump’s overall job approval rating has seen an increase to 43 percent. Slightly fewer now disapprove than did before. Forty-nine percent now disapprove of his performance. The Democratic Congressional Campaign Committee is aiming to defeat seven California Republicans who represent congressional districts where Hillary Clinton beat President Donald Trump — including a cluster of seats in Los Angeles, Orange and San Diego counties. The committee will send staffers in charge of overseeing House races in California, Nevada, Oregon and Washington to work out of an Irvine office in an effort to make inroads in Republican strongholds that have traditionally been sure bets for the GOP. IF YOU THINK THAT ORANGE COUNTY IS A PERPETUAL SURE BET FOR THE GOP, PONDER ONE STAT: NON-HISPANIC WHITES MAKE UP ONLY 41% OF ITS POPULATION. tally of 226 districts in 2012. This helps explain why House Republicans won 49 percent of all votes to House Democrats’ 48 percent in 2016 yet won 47 more seats. The House has become well-sorted out: only 35 of 435 districts “crossed over” to vote for presidential and House candidates of opposite parties, down from 108 in 1996. Today, there are 23 Republicans sitting in districts Clinton carried, and 12 Democrats sitting in districts Trump carried. However, this is slightly higher than the record low of 26 “crossover districts” following the 2012 election. The most striking House statistic in the last 20 years may be the decline of competitive districts, places where members have the greatest political incentives to work on a bipartisan basis. In 1997, our Partisan Voter Index scored 164 districts between D+5 and R+5, more than a third of the House, and greater than both the number of strongly Democratic and strongly Republican seats. After the hyper-polarized 2016 election, there are only 72 districts between D+5 and R+5 – less than one sixth of the House and a 56 percent decline since 1997. This also represents a 20 percent decline from just four years ago, when there were 90 swing seats.